Gears & Beers Bike Tours – Experience some of Detroit’s most notorious and interesting bars, watering holes and breweries by bike! Choice of self-guided or group tours. Beginning at 10am. Pick your “tour” / “wave” time at check-out. Afterparty from 4-8pm featuring food, entertainment and a commemorative pint glass with a beer. SAG (service & gear) provided by Downtown Ferndale Bikeshop. Routes stop at numerous participating bars for water, food specials & limited beer sampling along the way. Guests will receive beer sample vouchers valid for no more than 24 ounces while riding. Enjoy further sampling at the Boat Club Beer Fest being hosted at the Boat house — the official Gears & Beers Afterparty. 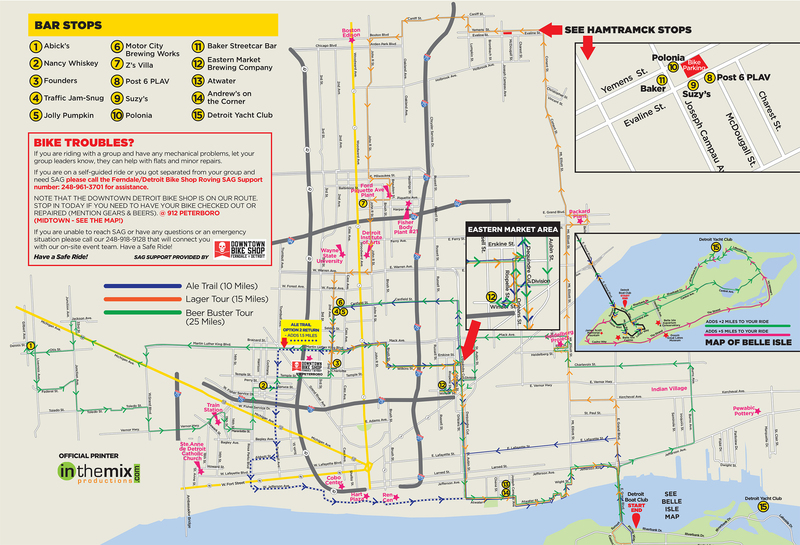 Note: Secure bike parking will be available at each stop along the designated routes. Maps with self-guided tour information with a well-marked course along the way for those who want to go at their own pace and make their own personal experiences. Note: The Ale Trail Route is only available as a self-guided tour. With the assistance of ride guides, you can bike in a larger group. Guided tours will start at specific times and leave from each pub at a designated time to keep the group on a fun-paced schedule. You can start or join a tour group at any time and decide to stay with the group or leave at any time! Specific tour times will begin at 10am and run every half hour until 11:30am.